Relate: If there is one name associated with the Protestant Reformation, it would be Martin Luther. Common tradition has it that he nailed those ninety-five thesis to the door of the Wittenburg Castle Church and the reformation swept over Europe like a flood. What this doesn’t take into account is that there were other men, like Erasmus who were already pushing reform before Luther and plenty of others, chief among them Zwingli, who were starting reformation movements almost simultaneously in other areas. There was actually a moment when these two men came together to see if they could combine their two reformation movements under one banner. In most areas these two were pretty much in agreement, but there was one area that both considered extremely important in which they could not come together. 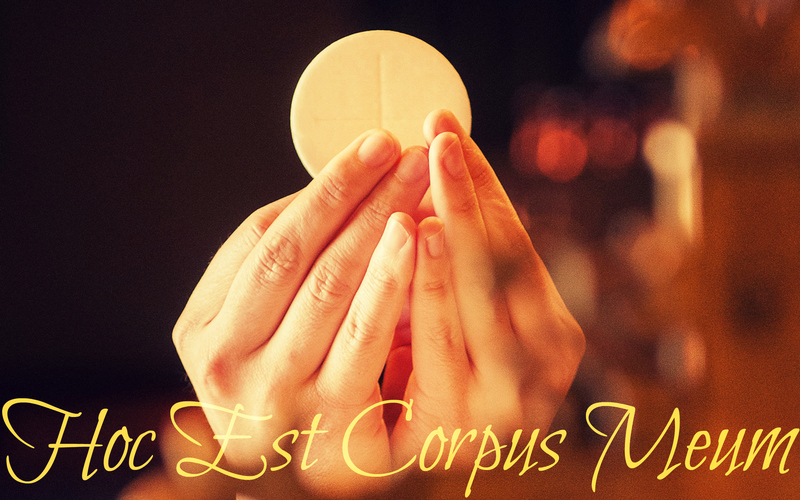 “Hoc est corpus meum”. During their discussion, Luther wrote this in the chalk on the table and both men went around and around on what “est”, (is) meant. Luther said it was literal. Jesus was saying this is my body. When we take communion we are literally partaking in the body and blood of Christ. Zwingli said the “is” was figurative. Just like when Jesus said “I am the vine” He did not literally mean he was an actual grapevine. The two could not find common ground and ended up going their separate ways. From this disagreement, the precedent was set for division upon division within the Protestant church into the literally thousands of denominations today. React: My initial reaction is to think, “Seriously? Is it that big of a deal that you couldn’t find unity on such a small point?” Well yes, actually, it is that big of a deal and no, it is not a small point. What both these giants in the faith realized is that remembering the Lord’s death through communion is no small matter and no matter which side you come down on, taking communion is of huge importance. Today it might be viewed as a tradition we do regularly or maybe its a nice breakup of the normal church routine, but Paul said that just such a flippant attitude was causing some within the early church to get sick and die. How seriously am I following God’s command to remember His death until He returns? Remember, too, the reason why Luther insisted so strongly on the Real Presence in the Lord’s Supper: he believed that in the Lord’s Supper, Christ really descended from Heaven to give us the forgiveness of sins and eternal life by feeding us with His body and blood. So for Luther, to reject Christ’s actual, physical body and blood was to reject the fact that the Sacrament is His way of giving us grace and forgiveness – it meant taking a “means of grace” and turning it into a work, which was intolerable to him. The Lutheran Church today follows him in this understanding, which is why we still stand very firm on the issue of Communion. Thank you for this beautiful song and thoughtful piece on communion. The writer of Hebrews makes it clear to the church that the actual blood which flowed from the wounds of our Lord on the cross happened once, and once only. Hebrews 9:12 Not with the blood of goats and calves, but with His own blood He entered the Most Holy Place once for all, having obtained eternal redemption. Jesus no longer suffers, nor is he put to the cross again each time we receive the bread and the cup. The sharing of communion; the Santa Ceia (Holy Supper) is to remember His death, the finality of His sacrifice for our sins, and to remember it together till he comes. This was such an excellent opening to discuss one of the two most Holy remembrances left to us by Jesus. (The other being baptism) The truth of the word of God is neither validated nor refuted by our opinions. Though I must respect the opinions of brothers and sisters who differ we also must not be afraid to address truth because it is around the truth of Jesus Christ that we will find our deepest unity. I pray this to be a great challenge and blessing to others. I have gone to church on several occasions with my Catholic friends, and when communion was offered, my friend told me that I should not go up to receive the host, because I wasn’t Catholic. I did as my friend said, and didn’t participate, but I felt sad. I was raised Methodist, where everyone is welcome to take communion, in remembrance of Christ and His sacrifice. I guess I’m still sad, and a bit confused about the different rules, even amongst Protestant religions. [sigh] I pray that the Lord understands, even when I don’t. I love your sincerity and openness. It is great to share with a fellow Christian our love for Christ! Maybe I can help you understand the Catholic position pertaining the distribution of the Holy Eucharist. First let me tell you that I understand why you feel sad for not being able to receive communion. I have a Methodist friend who I have invited to Mass and he feels the same way. “Therefore whoever eats the bread or drinks the cup of the Lord in an unworthy manner, shall be guilty of the body and the blood of the Lord. But a man must examine himself, and in so doing he is to eat of the bread and drink of the cup. For he who eats and drinks, eats and drinks judgment to himself if he does not judge the body rightly. For this reason many among you are weak and sick, and a number sleep. 31But if we judged ourselves rightly, we would not be judged. But when we are judged, we are disciplined by the Lord so that we will not be condemned along with the world”. So even Catholics that have serious sins cannot received communion. Unfortunately the level of catechesis in the most churches is poor and many Catholics don’t really understand this. 2. By receiving communion you are making a public act that signify that you are in full communion with all teachings of the Catholic Church…although as a brother in Christ we have more things in common than separates us going to receive communion telegraph everyone that you agree not in part but 100% with all the teachings of the Catholic Church. I don’t think that it will be fair for anyone who is not a Catholic to make such a public profession of belief without fully realizing it. Thank you Caleb, I appreciate the information that you posted. I do understand the Catholic belief of Real Presence in regards to the Eucharist. I think in my mind, regardless if I take communion in a Methodist Church or a Catholic Church, that the Lord already knows me, and the building (or religion?) isn’t so significant. We are all Gentiles, are we not? I think it’s the rules, beliefs, or as you explained, the teachings, that limit our expression of faith when we aren’t among our own. But then, I question who ‘our own’ really are. Personally, I believe we all belong to Him. I presume it all comes down to interpretation of the details. Yes, I agree with you, we all belong to him! It is through him and with him that we are fulfilled in God’s graces which are open to all baptized Christians and those who are searching and yearning for him. “That all of them may be one, Father, just as you are in me and I am in you. May they also be in us so that the world may believe that you have sent me”. “So Jesus said to them, “Truly, truly, I say to you, unless you eat the flesh of the Son of Man and drink His blood, you have no life in yourselves”. Think about how great is such a gift. The early Christians, those who knew that apostles and spread Christianity in the first century took this very seriously. St. Ignatius of Antioch the third Bishop of Antioch who knew the Apostle John and Paul warned against those who denied the real presence….such continuity of teaching can be traced through out 2,000 years of Christian teaching and it is only recently that it has been broken through novel interpretations. BJ, sadly I’ve had the same experience as Justl. Christ didn’t distinguish who gets to remember Him through the taking of the wine and bread, or how. He simply and humbly asked us all to remember Him together through sipping wine and breaking bread. His call was for us to love each other in unity. Separating ourselves due to His varied and elegant ways of teaching seems to me to be a slap in the face of His request to remember Him. A Catholic chiming in here. We believe that the bread and wine is transformed by those words at the consecration into the body, blood, soul and divinity of Jesus. When Jesus told people about this necessity to eat His body and drink His blood to have life everlasting, many disciples complained that this was too hard of a teaching. He said it again, and they walked away. He did not stop them or call them back and say that He was only speaking symbolically. This is also why St. Paul says that we are to receive the Eucharist worthily discerning the body and blood of Jesus or we eat and drink judgment on us, and which is why some are sick or have fallen asleep. That is why a Catholic will ask someone who does not believe that to not receive Holy Communion at a Mass. When we receive the Eucharist, the priest says “the body of Christ” and we reply “Amen”, which is we accept this Truth and all Truths of the Faith. It’s not to be mean or unwelcoming. Also, in John’s Gospel, Jesus says “And this is the will of my Father that sent me: that every one who seeth the Son, and believeth in him, may have life everlasting, and I will raise him up in the last day.” He does not say every one that “saw” him or “will see” Him, but those who “see” Him. How then can we see Him? In the Eucharist is the only way to do that, at least for the great majority of us who don’t have visions, etc. Luther was a Catholic priest and that was why he insisted as he did, and when he said those words, the change into the body and blood of Jesus occurred. BTW, Catholics call this “transsubstantiation” or you may hear this referred to as the Real Presence. Regardless of how you see the act of communion it is important to all Christians. As Stecveesq above says “every one who seeth the Son, and believeth in him, may have life everlasting, and I will raise him up in the last day.” Who knows who really believes but Jesus Himself.. It is not any of ours place to decide who can or can not know Jesus and therefore receive His presence, or take of His Body and Blood. As I believe a “body” is a body only so long as it contains a soul (without which it becomes a corpse), so I believe that when Jesus spirit is invested in the host by the ritual he proclaimed, so it becomes his “body.” That we also are offered the “blood” suggests that he comes in two parts, which is a mystery I haven’t pondered. However, I myself do not partake. I have strong reasons to believe that the time for remembrance is past. Now I’m curious… what might those reasons be? When I visited a Catholic church after 25 years away, I confronted this wounded man on the cross and instinctively put my hand over my heart and held it out to him, thinking “use this for healing.” Having taken the posture of surrendering to the service of his purposes, I’ve since had a number of incredibly powerful experiences that give me a strong sense that the work described in Revelation is well underway – actually almost to the point of the rider arriving on the horse. Of course, I can’t prove any of this, so I consider it a matter of personal faith. Last Supper on the word. This was a very informative post and without judgement, (I hope) but maybe with some sadness we can see that the argument between Zwingli and Luther has been repeated in the comments. I think God is more interested in us loving each other and Him than in us protecting the things that divide us. I look at your last point and wonder how dead am I today and how much resurrection life and power is working through me?